Akash Vincent is a singer-songwriter living in New Delhi. He started his musical training on drums, which he played throughout high school and college. He first felt drawn to songwriting during sessions with his college band. In these practices he realized he had a strong imagination and clear vision for how he wanted to craft the songs and decided to write songs under his own name. He recorded his songs on his own at first, at one point playing each instrument himself, but it wasn't until he met drummer and co-producer Nikhil Mawkin and bassist Abhinav Khokhar that he found the synergy he was looking for. This led to the release of Akash's first EP, titled Postcards. With its release on 10th January 2015, Postcards introduced Akash to the music community in Delhi as a singer-songwriter and guitar player with a refreshing and honest sound. Akash toured the album as a solo performer playing in intimate settings in Delhi, Mumbai, and Bangalore where he sold his music and gave away postcards. Whistling Duck Indie Fest in Chandigarh hosted his first trio performance with Nikhil on drums and Abhinav on bass. The Piano Man Jazz Club, Delhi's foremost live-music venue, welcomed a richer sound with Rohit Gupta also joining in on keyboard and trumpet. Akash released his second EP titled Polaris on August 10th, 2017, songs from which he performed live on Sarthak Cafe radio show on 94.3FM. Vatsal Bakhda, pianist/composer, started his musical journey in Kolkata learning Classical Piano under Roshen Gazder, LRSM with whom he spent over 10 years, and Suddhaseel Sen (Ph.D. in Musicology) for 2 years. He continued his music education further at Swarnabhoomi Academy of Music, where he spent three semesters learning under Pedro Carneiro Silva and Gabriel Geszti, both of who hail from Brazil, equipping him with a unique playing style with strong traditional Brazilian influences. He continues to grow and develop currently while learning with Aman Mahajan. A quick learner, Vatsal is also currently a part of an upcoming project, called Figo Maneiro. He has also had the opportunity to collaborate with various artists from an upcoming Mumbai-based record label, Nrtya. His time at SAM has enabled him to playing various styles such as Jazz, Funk, Latin, Brazilian, RnB/Soul, Pop, Fusion, Blues,etc, and greatly takes influences from various artists such as Avishai Cohen, Tigran Hamasyan, Shai Maestro, Brad Mehldau, to name a few. Vatsal is also currently working extensively on his own music, and wishes to bring it out by the end of 2018. 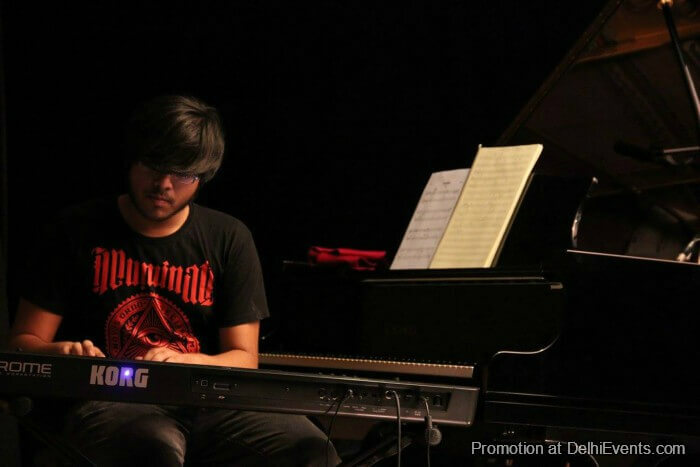 A music educator himself, Vatsal is currently working as a Piano Teacher at Theme Music Institute.